veggie wedgies | eating with S.O.L.E. 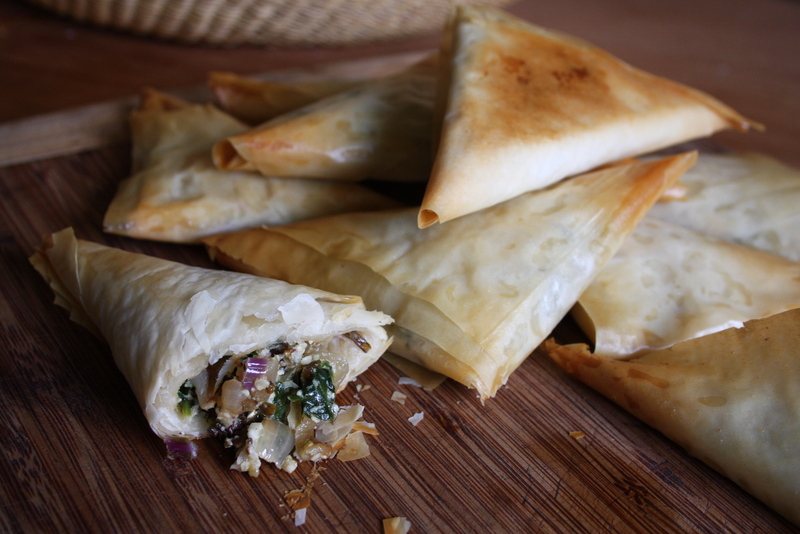 Something magical always happens between the sheets of fillo pastry, and this easy savory recipe is no exception. Hearty greens blended with local cheeses, caramelized onions, hemp seeds and grainy mustard is the perfect combination of flavors and textures for these little ditties. I served these along with a roasted squash soup, and it made for a great crunchy oozy accompaniment, but they would also make a lovely appy. Thaw a box of frozen organic fillo pastry to room temperature. In a small pan caramelize 1 large yellow onion in butter, seasoned with S+P, and a few toes of minced garlic. Cut your fillo as an entire roll into thirds. Use 2-3 strips of fillo to portion about 1 heaping dinner spoon into a nice triangle fold. Brushing well with melted butter between layers and folds. Bake at 350º for 15 minutes and enjoy.